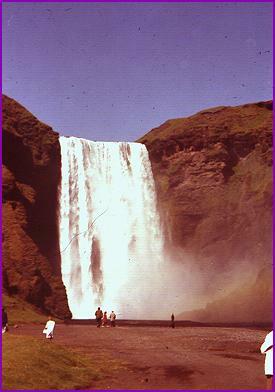 In 1974 I decided to go to Iceland. At the time, I thought it was one of the most exotic and unknown places I had ever heard of. Actually that turned out to be true. 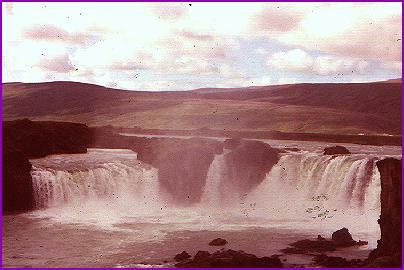 I didn't know a single person who had gone to Iceland, and when I told people where I was going, they thought I was nuts. It was my first trip outside the United States, and I must say it was an excellent choice. 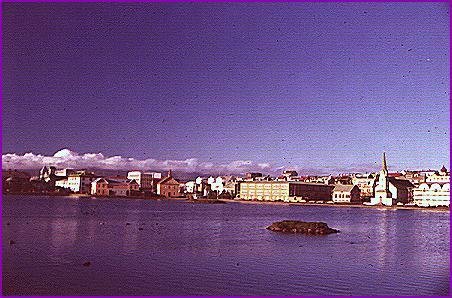 This is a shot of Reykjavik, the lovely capital city. In July the sun is up for 20 hours daily. This picture was taken approximately 10:00 PM local time. 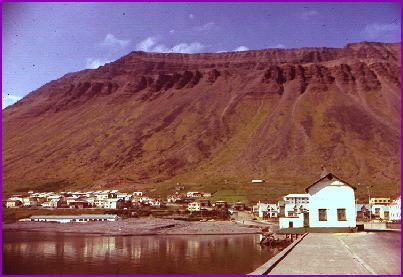 Here is the western city of Isafjord and some pasture area outside it. One of my adventures was to climb on top of a glacier. 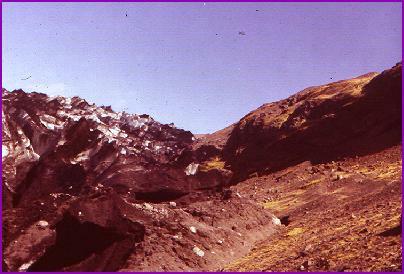 In the picture on the left, the glacier is the black-and-white area on the left side. It is that way because it's covered with a sprinkling of volcanic ash. The ice of the glacier itself is a deep, startling sky blue. You can hear a lot of water rushing around inside it. In fact, the melted water from the glacier produces some pretty amazing waterfalls (right photo). 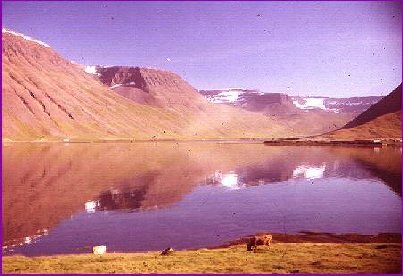 The Lake Myvatn area near the northern city of Akureyri is only a few scant miles short of the Arctic Circle, and is an eerie, surrealistic landscape of volcanic activity. 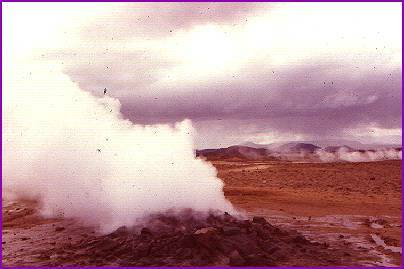 The land is very young in geological terms (only about 5000 years old), and active steam vents are everywhere.